After a tense couple of days, incredibly SBSTA came to a close today, with decisions adopted for Article 6 – a feat which, last night and earlier today, seemed out of reach. requests new roundtable discussions before SBSTA 48, which begins 30 April 2018, and a related informal document capturing the discussions. While these were good steps forward, and built on the collaborative nature of last week’s negotiations, they drew fierce opposition from Saudi Arabia, Egypt on behalf of the Arab Group, Venezuela and the Like-Minded Developing Countries (LMDC) grouping. They instead were proposing simple procedural conclusions, that would take note of the third iterations and continue discussion at SBSTA 48 in April/May. Locked in a stalemate, the tension ratcheted up. It later emerged that these Parties were blocking progress on Article 6 to tie it to negotiations on response measures – where they were not happy with how that agenda item was unfolding. After a very late night (or very early morning, depending on your perspective), talks resumed at 10am today, with an unexpected appearance by the SBSTA chair. He gave initial remarks that Parties essentially needed to get their act together – that he was pleased with the amount of work done, but that this was their last chance to capitalise on progress and get something meaningful to move forward. Talks broke briefly, then resumed at midday – which essentially was a rerun of yesterday’s discussions. The co-chairs intervened and said that if agreement could not be reached, it would trigger rule 16 of the UNFCCC’s rules of procedure. This would essentially mean that there would be no conclusion, and that the work done in Bonn would not be recognised, would have no status in process, and would not capitalise on discussions. After some discussion, the negotiators settled on a version of the note that only took note of the informal notes, the existing submissions and that asked the SBSTA chair to prepare draft text. They then broke again for a few hours to huddle and consult among themselves to see if they could bridge their differences. Saudi Arabia, the Arab Group and LMDC bloc held back to see what was going on in other rooms. They managed to talk across rooms during this gap, with some horse trading between Article 6 and response measures. Word then broke that there had been a breakthrough. At 3pm, the group met for the third time. Having led the consultations, the EU presented the compromise, which was ultimately adopted. So we have a text. Not a perfect text, but that’s the nature of compromise. The final agreement will see no new submissions, but it does mandate the SBSTA chair to prepare an informal document containing draft elements of a draft decision based on prior submissions and the informal note. This conclusion was passed to SBSTA, which began its closing plenary today (although will wrap up tomorrow, when this will be adopted). Statements from observers took place today in a combined SBSTA-SBI plenary, and IETA’s China representative Min Li spoke on behalf of the BINGO grouping. Her intervention can be viewed online; she begins at 27.30. On the CDM, talks remain deadlock. At issue is a Brazil proposal to add language on voluntary cancellations to scale up pre-2020 action; other Parties want to add language to this to ensure no double counting. Brazil is digging its heels and threatening to kill the whole thing. One seasoned observer remarked that this is a hangover from COP22, when Brazil was willing to compromise, but others refused and are now enduring some payback. At IETA’s AGM today, the membership adopted its 2018 priorities and voted Rick Saines of Baker McKenzie as the new chairman and Jonathan Grant of PwC to vice-chairman, alongside Matthew Bateson of Rio Tinto. 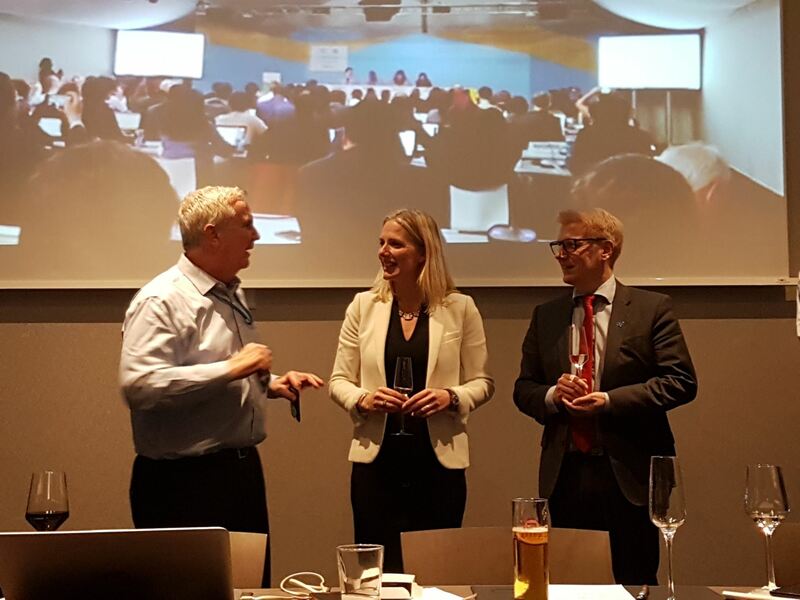 The meeting concluded with a debate about the future of offsetting, then a surprise guest appearance by Canada’s Environment Minister Catherine McKenna and her Finnish counterpart Kimmo Taiilikainen. We have reached the halfway point of COP23 – and have the texts to prove it. This first week at “Fiji on the Rhine” has seen several parallel meetings taking place – at time, it can feel overwhelming, especially if you’ve not been to a COP for a while, or if it’s your first time. We’ve been tracking market-related matters, which so far has been primarily for the Paris Agreement Article 6 negotiations, which are under the Subsidiary Body for Scientific and Technological Advice (SBSTA). 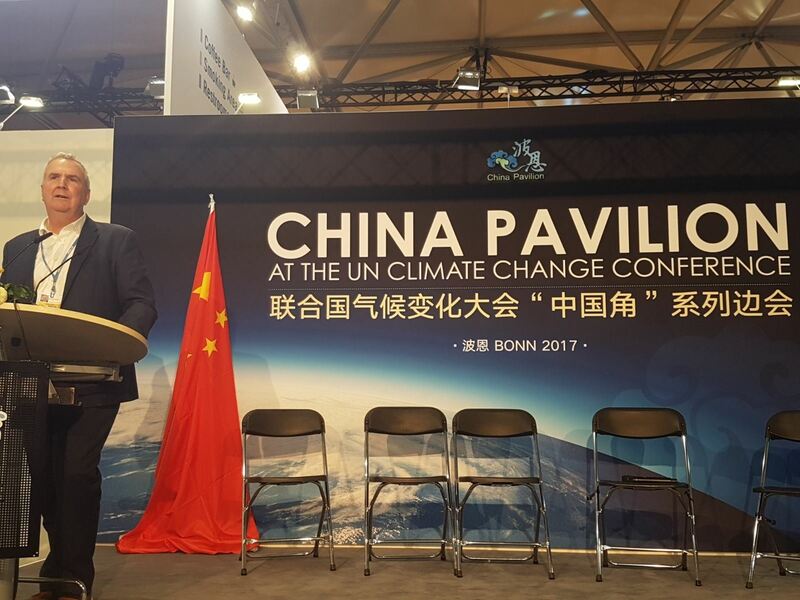 Parties also began work on guidance relating to the CDM on Friday, which falls under CMP (Conference of the Parties serving as the meeting of the Parties to the Kyoto Protocol). On Article 6, the week’s talks have been productive and well-structured, with informal sessions focusing in turn on the three issues: Article 6.2 (cooperative approaches), Article 6.4 (emissions mitigation mechanism), and Article 6.8 (non-market approaches). Over the course of the week, negotiators have been working from informal notes prepared by the co-chairs, which initially drew from Parties’ submissions and a workshop last weekend and have been updated throughout the week. Remarkably, negotiations at all levels have been kept open to observers all week. The third (and final?) iterations of these notes were released this morning, following informal meetings Friday and Saturday. While the non-market approaches note has seen just two extra pages added since its first note, the emissions mitigation mechanism note has almost doubled over the course of the week and the cooperative approaches note has ballooned from eight pages to 26. (For those that want to look at the evolution of the notes, all iterations are available on the SBSTA 47 in-session documents page, under agenda item 11.) That is not overly surprising, given that the sessions were less negotiations and more an airing of views, with Parties adding elements that they felt were missing. Bear in mind, these notes are just the headers for what will ultimately form the structure of the Article 6 rulebook, so there’s a lot of growth expected. Fun fact, of the 197 pages of the Marrakesh Accords – the rulebook for the Kyoto Protocol – flexibility mechanisms (CDM, JI and international emissions trading) account for 66. So watch the Article 6 collective pages add up. The only real potentially awkward moment came on Saturday, when Brazil and a few other Parties brought up common but differentiated responsibilities, with a view to having it included in the preamble to the Article 6.2 notes on cooperative approaches. This could be linked to moves to keep the guidance for users of Internationally Transferred Mitigation Outcomes (ITMOs) separate from those for countries issuing ITMOs. The co-chairs moved to end the discussion to preserve the work done this week. Over the next couple of days, Parties will meet to discuss the latest notes and talk about the way forward. The co-chairs will prepare draft conclusions for the contact group to pass to the SBSTA Plenary, which meets from Tuesday for its closing session. It is expected that the conclusions will lay out a timetable for submissions and roundtables ahead of the next SBSTA meeting, in April/May 2018. Meanwhile, a new draft text on guidance relating to the CDM was released yesterday, following the first session of talks on Friday. Five paragraphs of the preamble have been agreed, and two of the 22 in the text. Talks are expected to resume tomorrow; check the schedule for the CMP. Elsewhere, the BINGO constituency group has prepared talking points in response to issues around conflict of interest. Please contact Katie Kouchakji at kouchakji@ieta.org if you did not receive them (they were sent around midday CET on Saturday by ICC). A reminder for those new in town this week, the BINGO group meets every day at 9am in meeting room 11 in the Bonn zone. 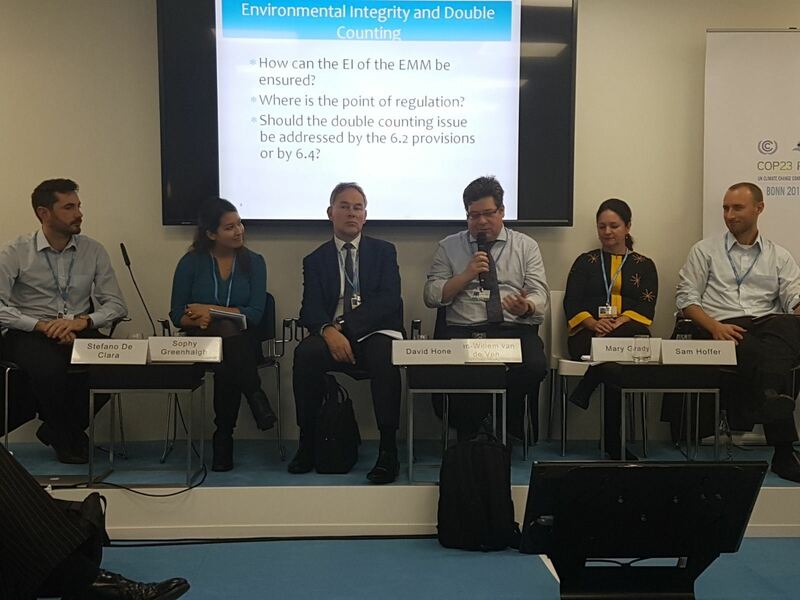 At the IETA Business Hub, our first week saw a truly impressive series of events, including a packed interactive discussion about the future of offsetting and the new mitigation mechanism established by Article 6.4. Featuring remarks from David Hone of Shell, Mary Grady of American Carbon Registry, Jan-Willem van de Ven of the EBRD and Sam Hoffer from VCS, the panellists and audience covered issues such as accounting, the scope of the new mechanism, the interaction of the mechanism with Nationally Determined Contributions, a role for existing standards and protocols, and ensuring environmental integrity. Tuesday, 5pm: IETA AGM followed by reception – contact us if you need the information. 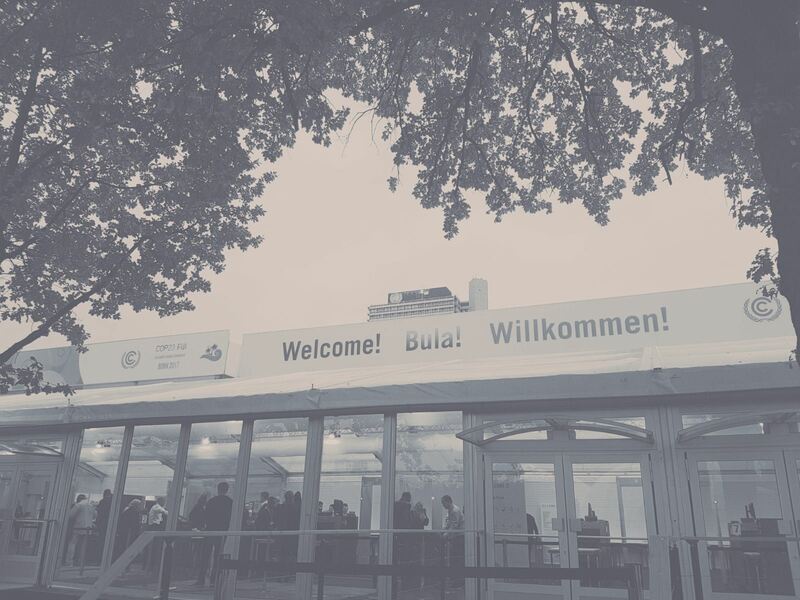 The IETA Business Hub is in zone A in the Bonn zone - we look forward to seeing more of you this week! Four days in, and COP is noticeably busier. Indeed, more of our members have arrived in the past couple of days; it’s been great to see so many of you at our Hub. If you’re arriving over the weekend, we’re in the Bonn zone, in zone A, at the very end of the hall. It’s a nice, open space, with a great agenda of events, good networking opportunities, lots of familiar faces, and we have free coffee – what more could you want? Away from the Hub, all the way over in the Bula zone (and by all the way, we really mean aaaaallllll the way over in the Bula zone – those who are yet to arrive, definitely download the Nextbike app if you plan to go between Bonn and Bula), talks on Article 6 are gathering pace. Yesterday and today saw the informal sessions rattle through the three notes released overnight on Monday (available here, under item 11), starting with Article 6.4 (emissions mitigation mechanism) yesterday afternoon. Despite starting late, the group managed to get through the entire note in the time remaining – which was no easy feat. Although less of a negotiation and more of an airing of views, there is a willingness to progress that perhaps has been absent in the past. Differences remain however, which one observer characterised as “Brazil against the rest of the world”. Some Parties are calling for the units created as a result of the emissions mitigation mechanism to only take place within the host party’s NDC, and thus a corresponding adjustment to their NDC would be required in line with 6.2. Brazil, however, is a big proponent of limiting the mechanism to activities which are in addition to the NDC – which raises questions about how a Party can then use the credits to meet their NDC. And, if there is a corresponding adjustment, some Parties are calling for it to be made at the point of issuance, while others are proposing at point of use/retirement. There were also requests for clarity on the use of other standards, such as voluntary standards, and on the use of CERs. Key for IETA, a number of Parties are keen to include proposals on incentivising non-state actors as well – watch this space. This morning, the group went through the note on Article 6.8 (non-market approaches). We won’t go into much detail, but it was encouraging that they got through the whole paper in 90 minutes. This left only Article 6.2 with issues outstanding, which were dealt with this afternoon. The main substantive issue was around the proposed merger of sections 3 and 4 (relating to the use and issuance of ITMOs), with most Parties trusting the co-facilitators to accurately reflect the discussions in a new streamlined note. However, the Arab Group was pushing for simply adding new proposals to the current structure, ie so both a separate 3 and 4 and a merged version. In the end, the co-facilitators emphasised the need to push ahead with a streamlined text rather than a cumbersome compilation. We are eagerly awaiting their new take on the topic. New notes on 6.2, 6.4 and 6.8 are expected overnight, with a contact group meeting expected tomorrow morning ahead of another cycle of informals on each issue in turn. Watch the daily programme tomorrow for more information on meeting times and locations. Elsewhere, the conflict of interest issue was raised again yesterday at a constituency open dialogue with the presidency, with continued pressure from some to exclude business observers from the UNFCCC process. One observer commented that this is a “coordinated” manoeuver by some NGOs and a few like-minded Parties, although it was also noted that all observers have an interest in the outcomes. The SBI president diplomatically pointed out that this issue falls within his remit, and the conversation was contained by the Presidency and secretariat. However, it is not likely that this is the end of it. Tonight, IETA and CMIA were honoured to award the first Carbon Pricing Champion Award of the COP to the government of New Zealand, given to Kay Harrison from the Ministry of Foreign Affairs. This was in recognition of New Zealand’s work on their ETS reform, making it more robust and linkage ready, as well as taking a leadership role on markets at the UNFCCC. Hallo from Bonn to all our members! The first two days at COP23 have almost been and gone, and negotiators are getting down to work in earnest. But first, some potential positive news, with reports that Syria is set to sign up to the Paris Agreement – leaving the US as the sole outsider. On the negotiations, and specifically Article 6, which are agenda item 11 at SBSTA47. The overall aim of the SBSTA talks is to focus on substance this week, and then procedure early next week, with a view to adopting conclusions next Wednesday (15 November), ahead of the start of the high-level segment on Thursday. It’s an ambitious timetable, but it is encouraging that things got swiftly underway. The talks began yesterday with the release of three informal documents, which the co-facilitators prepared following a workshop over the weekend, relating to item 11a, Article 6.2 (cooperative approaches), 11b, Article 6.4 (emissions mitigation mechanism), and 11c, Article 6.8 (non-market approaches). An initial contact group was held yesterday afternoon, which set out the work plan for these negotiations. Overnight, the co-facilitators prepared three new notes, representing a proposed text to work from. Again, these were structured into Article 6.2, 6.4 and 6.8. These new notes draw from the weekend’s workshop as well as submissions from Parties prior to COP. However, Parties had not had long enough to look over the new papers, so during this morning’s contact group the co-facilitators simply walked Parties through the text. Work resumed late this afternoon, with the first informal session, focused purely on 6.2. The group worked through the headings and sub-headings, and got through sections 1 and 2 (principles and definitions), and halfway through 3 and 4 (guidance for using ITMOs towards an NDC, and for countries issuing an ITMO) before the allotted two hours was up. The next informal, expected tomorrow, will focus on 6.4, the one after on 6.8, then cycle back around to 6.2. Part of the issue regarding sections 3 and 4 is that some Parties would like to see the two merged into one, since there is a lot that is relevant to both an issuer and a user of ITMOs. However, not everyone agrees, so there is some debate to be had. Elsewhere, ICROA Director Simon Henry had the opportunity today to deliver the BINGO interventions at the CMP Plenary on the CDM and JI. His statements can be seen online; the CDM one begins at 05.57 and the JI at 12.50. 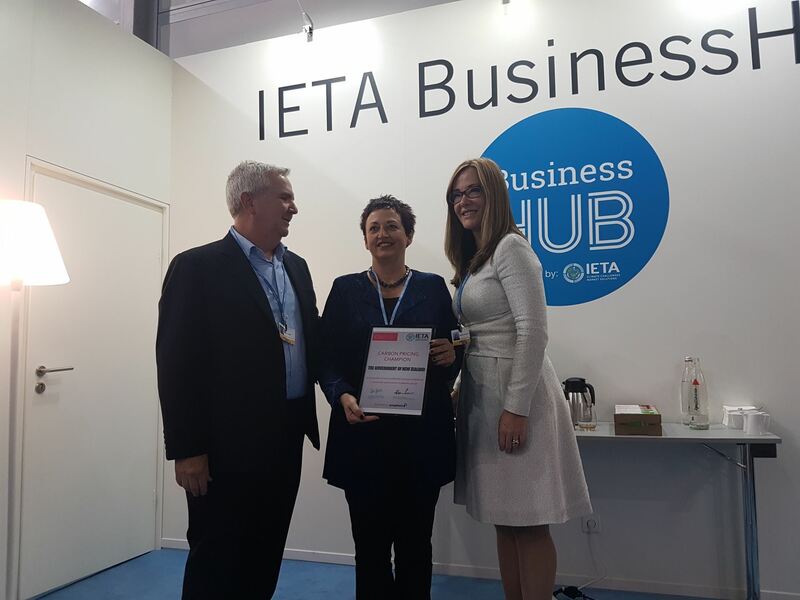 Today also saw the launch of IETA’s Business Hub side events. 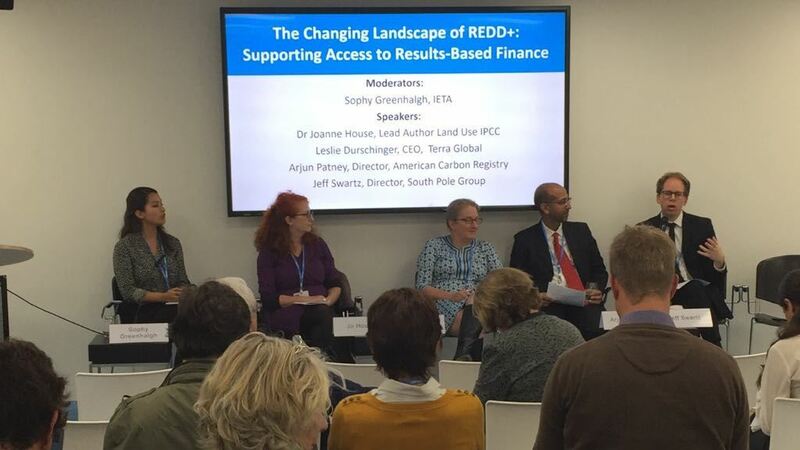 With over 70 events throughout the COP, we eased ourselves in with two events today, focused on innovations to implement SDGs then a busy session on access to REDD+ finance. Events resume tomorrow at 9.30am, with events for BMUB, VCS, IAEA and, of course, ourselves. Our full programme is available on our COP23 webpage. If you’re in Bonn and yet to visit our Hub, we’re in the Bonn zone, in zone A – come in the main entrance, turn right and keep on walking to the end, past WWF’s Panda Hub, Thailand, Japan and Korea. Note to members on the ground in Bonn: We are issuing a Daily Bulletin, offering a brief recap of the day at the COP and a preview of the day to come. If you are at the COP but not on IETA’s delegation, please email Katie Kouchakji at kouchakji@ieta.org if you wish to be added to the mailing list. That’s all for tonight. The next update will be sent on Thursday. In the meantime, don’t hesitate to contact any of the IETA team with any questions.